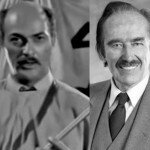 You’ve probably seen this really bizarre story of the Twilight Zone-like episode of the TV show “Trackdown” from 1958 which bears some difficult-to-believe resemblances to 2019 America. A conman named Trump comes to a town and gets everyone panicked that the world is about to end unless they agree to let him build a wall that will save them. As I wrote yesterday, when I first happened on the story I had to read it several times and then check it several different ways because I was sure it had to be a hoax. It’s not. Here’s our story if you missed it yesterday. But is this totally a weird coincidence? I think there’s a decent chance it’s actually not. "A Little Bit of a Political Bind"
The only thing I will ask you though is on the wall, you and I both have a political problem. My people stand up and say, “Mexico will pay for the wall” and your people probably say something in a similar but slightly different language. But the fact is we are both in a little bit of a political bind because I have to have Mexico pay for the wall – I have to. I have been talking about it for a two year period, and the reason I say they are going to pay for the wall is because Mexico has made a fortune out of the stupidity of U.S. trade representatives. I had to check this ten different ways before I could believe that it wasn’t a hoax. But it’s real. In 1958 CBS aired an episode of ‘Trackdown’ in which a conman named “Trump” bamboozled a town of people into believing that only he could save them and that he would do it with a wall. Here’s the story. I don’t know anything about Jeff Bezos. I don’t know whether he and his wife were already getting a divorce and had begun dating other people or whether the news about his relationship/affair triggered the divorce announcement yesterday. He’s no kid in a cage on the border. But I do not think we can ignore the fact that the story was broken by The National Enquirer and that the Enquirer has served as a personal attack vehicle for the now-President for a couple decades. Welker: "Does the buck stop with you over this shutdown?" Good, important basic rundown. When we get Trump’s taxes, what will they tell us? And what won’t they tell us? President Trump enjoyed unified control of the entire federal government for two years. He forgot to get his wall funded during those two years. Now he’s taken the entire federal government hostage at the point at which he probably can’t any longer get it. Not only do no Democrats support any version of the President’s wall fantasy. They don’t fear his supporters or his bully pulpit. They just concluded an election in which Trump made border paranoia and race baiting the central campaign issue. They won a resounding victory. Democrats have no incentive to give him anything to encourage his reckless behavior and they are in fact offering nothing. 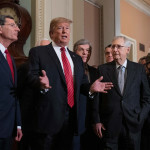 Republican leaders today were verging on apoplexy because Democrats were refusing to negotiate in response to Trump’s hostage taking. Former House Speaker John Boehner is starring in an informercial about how you can make your first million selling weed. As you’ve probably seen, The New York Times issued a major correction early this afternoon. They now say that Paul Manafort had his Ukraine-based fixer Konstantin Kilimnik send polling data not to Oleg Deripaska but to Serhiy Lyovochkin and Rinat Akhmetov, two Ukrainian oligarchs who were major financial backers of deposed Ukrainian President Viktor Yanukovych, Manafort’s longtime client. This is a pretty big difference and a major error by the Times. But I’m not sure it really changes the big picture. These are both oligarchs tied to the pro-Russian faction in Ukraine, though Akhemetov seems now to have fallen out or at least strayed from the Moscow line and is now paying a price for it. As I signaled last night, the seemingly accidental redaction error in the Manafort legal filing combined with the news published mid-evening by The New York Times is one of the biggest revelations in more than two years of the Trump/Russia scandal. It’s bigger than the Trump Tower meeting in June 2016, though the two cases can’t be fully understood without reference to each other. Just as importantly, these new revelations combined with earlier reports effectively end the debate about whether there was ‘collusion’ between Russia and the Trump campaign during the 2016 election. There was. It wasn’t marginal. It was happening at the very top of the campaign. The campaign manager was secretly funneling campaign data and information to a Russian oligarch closely tied to Russian President Vladimir Putin, someone who had no possible use for such information other than to use it in the Russian efforts to get Donald Trump elected President. Let’s review the key details.